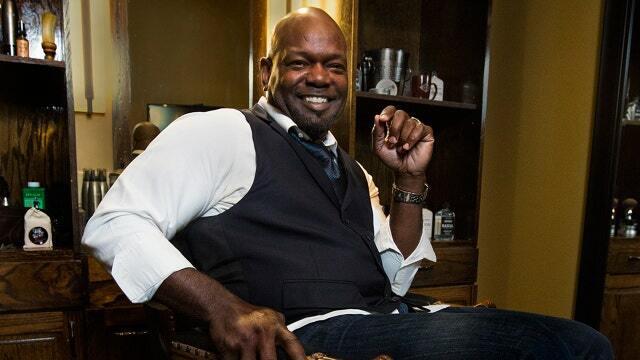 Former running back Emmitt Smith has joined a new venture as co-owner of a menâs only spa. He still reigns as the National Football Leagueâs all-time leading rusher. But, former Dallas Cowboys running back Emmitt Smith, now out of the game, has transformed himself into quite the entrepreneur, developing everything from real estate to construction companies through his business, Emmitt Smith Enterprises, Inc.
Now, the hall of famer is getting into the barbershop business as a new co-owner of the menâs lifestyle club called The Gents Place. âMen now have a place to go and get their grooming, just like females have a place to go to get their grooming and get all pampered and dolled up,â Smith tells FOXBusiness.com. The Gents Place is an ultra-premium menâs grooming and lifestyle club where men pay a membership fee to enjoy services like a seven-course hair treatment, hand repairs, and even a nose wax. The club was founded in Texas in 2008 and has since expanded to four locations, three in its home state and one in Kansas. âWeâre looking to grow to 150 franchise locations nationwide over the next five years,â Ben Davis, Founder of The Gents Place tells FOXBusiness.com. Davis says he also partnered with Massage Heights, a national massage therapy franchise to help grow his business but choose Smith because of his knowledge in business. âMost people think of him as a professional athlete but heâs actually an incredible businessman and a real estate expertâone of the best that I know,â Davis adds. Smith says his role in the company is to open doors for people who want get into franchising. âWe will give them the opportunity to get returns that weâre starting to see on our side of the equation but most importantly to be involved in what I call a âmovement,ââ Smith said. That movement, he says, is empowering men to look and feel their best which is something that Smith says he gains every time he rushes out from a service. âWhen I walk out, I obviously walk out confidentânot arrogant, but confident. I feel like a million bucks and looking, well thinking, Iâm looking like a million bucks at the same time,â says Smith. The club is membership only and price points vary depending on how many services you get per month. âWe will get a 23 or 24 year old fresh out of college who is aspirational, who wants to be the manager or executive, or the next Emmitt Smith,â says Davis. Smith says that building a business every day is definitely harder than playing in the NFL. âIn the NFL, you can always evaluate talent but in business the only way you can evaluate talent is by putting them in and giving them an opportunity to do something. Sometimes that talent rises up and sometimes that talent doesnât and it can be very costly. And, that is the very challenging part of it,â he said.